Lake Como, Lake Maggiore, Lake Orta, Lake Iseo, Lake Bracciano & Lake Garda Destination Wedding Photographer for your Italian Lake Wedding. Whether you’re organising your Italian lakes wedding adventure all by yourself or using the talented team at Italian Lakes Weddings. You’re sure to have a fantastic time. Lake Garda is one of the better known lakes of the Italian Lakes District. It is located between the Veneto and Lombardy regions and it is the biggest Italian Lake. Lake Garda has also a great history, its castles dominate the East side of the Lake such as Castello di Malcesine, Torri del Benaco and Castello di Lonato. They can all host outdoor legal ceremonies overlooking great panoramas. Feel free to contact me to find out more about my destination wedding photography and for a bespoke quote for your wedding or elopement. All of the Malcesine areas are perfectly preserved in its ancient and medieval appeal. Malcesine Castle was probably built before 500 AD and not it is a property of the Town Hall. This means that it can host civil ceremonies on its grounds. It’s a great opportunity for the couples who are keen for a lovely wedding in Malcesine. It is one of the few locations on the Lakesides that allow legal civil ceremonies outdoor facing the lake on the ancient and fabulous terrace. In August 2017, I was lucky enough to travel to Malcesine to photograph a beautiful wedding, needless to say, I fell in love with the area and it would be a pleasure to return again to photograph more weddings. Although I would happily get on a plane just to eat the pizza! 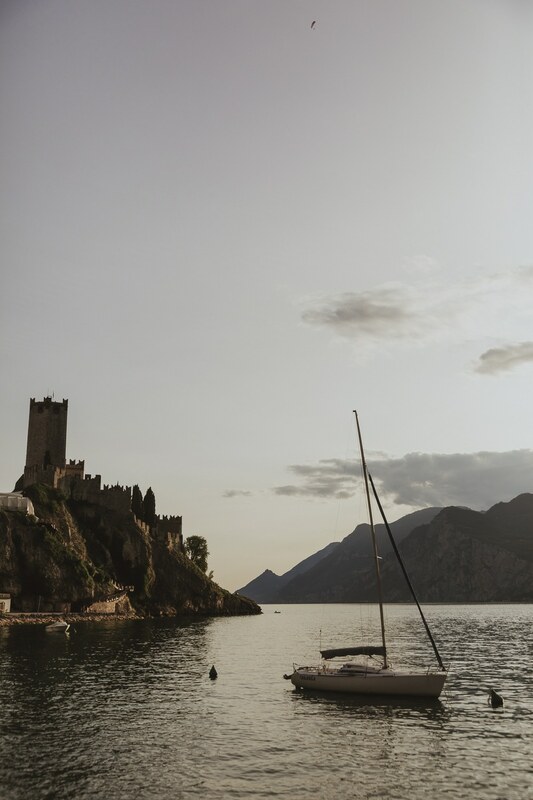 The gorgeous town of Malcesine is stunning and lends itself to weddings in a fantastic way, especially when you can get married on the rooftop of a castle overlooking the lake! I mean, come on that’s awesome! It also has fabulously small cobbled streets that most cars cannot drive up and so a classic Fiat 500 is needed to transport the couple around while guests take in the town walking to each venue for the day. If you’re thinking of marrying or eloping at any of the Italian Lakes then feel free to contact me about your photography.